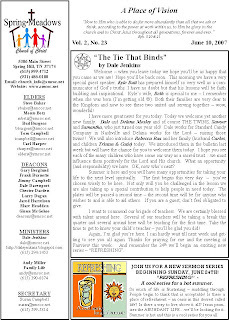 The best of them keep us up to date...let us inside a little even if we are not there...give a congregation a personal touch and a personality...tell us the good stuff. I’m sort of a church bulletin aficionado. When I first started preaching I thought that was a great place to get material, articles, ideas, and just to keep up with our brotherhood. So I wrote the 10 largest congregations in every state and then every congregation of over 400 members. When I would be speaking somewhere or on vacation or traveling I would carve out about an hour and call churches in that area and request to receive their bulletin or newsletter. At one time I used to get over 350 bulletins a week. Of course I didn’t read every word of every one but I would scan each one for ideas and over time I learned which ones typically had good stuff in them. I had several favorites (other than one’s written by family members, who’s I naturally enjoyed). I only knew the man by reputation and didn’t know a single member there but I would read Brother Jim Bill’s every week – what a writer! And then there was Paul Roger’s in Centerville – another favorite. Then there were some that the design and graphics were fabulous. I’ve been editing a church publication now for 25 years. There was the Kossuth News, The Informer at Eva, also The Informer at Hamilton Crossroads in South Alabama, The Hamilton Herald in Hamilton, of course AIM at Granny White and finally our little bulletin here at Spring Meadows. BUT our bulletin doesn’t have a name. So here’s your chance. What would you name our bulletin? Be creative. Have fun with it. Give me two or three of your best suggestions. I’ll pick some from there and we’ll take a poll. I HOPE WE GET A LOT OF SUGGESTIONS. You can post anonymously. Log in and fire away!